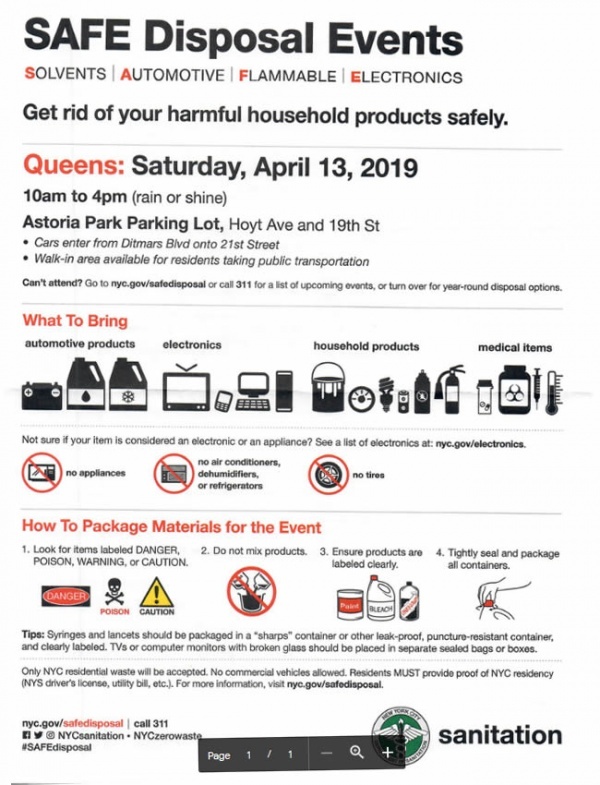 The Department of Sanitation is holding its bi-annual SAFE (solvents, automotive, flammables, and electronics) Disposal Event at Astoria Park this Saturday which offers Queens residents a chance to responsibly dispose of their hazardous waste. The event, to be located in the Astoria Park parking lot at Hoyt Avenue and 19th Street, will have crews accepting residents’ hazardous waste, rain or shine, from 10 a.m. to 4 p.m.
Crews will accept hard-to dispose-of items that are potentially harmful to sanitation workers, children, pets, and New York’s water supply, if not correctly thrown away. Accepted items include household products such as pesticides, strong cleaners, paints; mercury-containing devices, thermometers; automotive products such as oil, transmission fluid, and auto-batteries; cosmetics, medication, and syringes, which must be clearly labeled and put in a puncture-proof container. Sanitation workers ask that these hazardous products be labeled clearly, tightly sealed, and if leaking or broken, placed in a separate box or bag with absorbent material such as sand or animal litter. 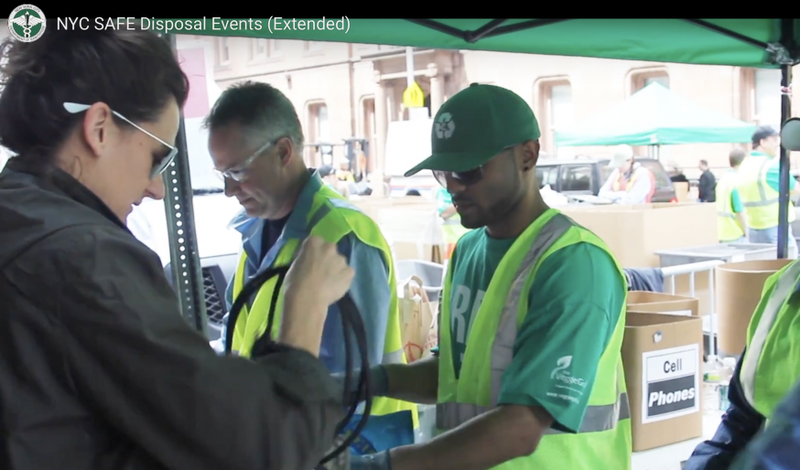 Electronics, such as computers, printers, and televisions, which can no longer be collected with trash and other recycling, according to New York State, will also be accepted at the event. “People look out for these events all year,” said a spokesperson for the Department of Sanitation, who also explained that there are dangerous consequences to disposing of these items in the wrong way. The spokesperson described incidents in which residents threw away hazardous waste and consequently harmed sanitation workers. 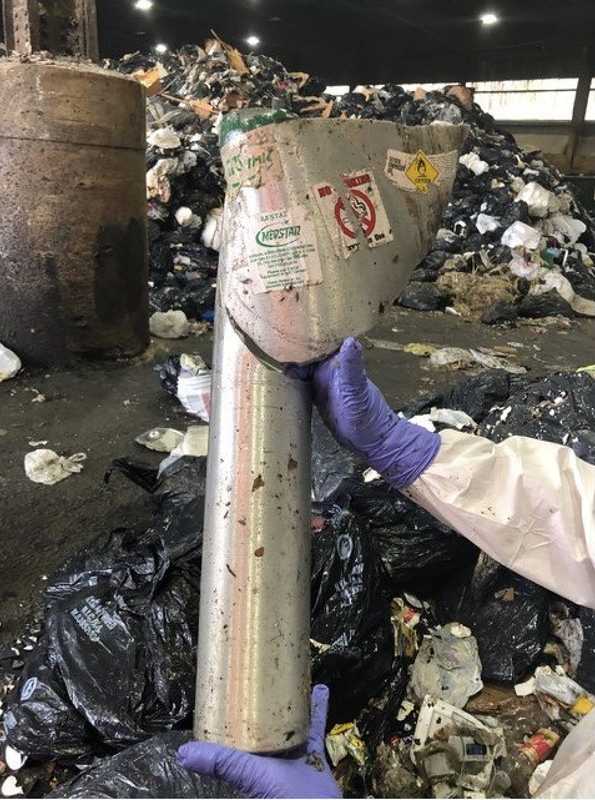 One incident involved a resident throwing an oxygen tank in the garbage, causing a garbage truck to explode and harming two sanitation workers. Another incident included someone throwing away acid in the regular garbage, also resulting in the harm of sanitation workers. Materials collected are either recycled, blended for fuel, or sent to licensed hazardous waste treatment facilities for safe disposal. Electronics are correctly recycled or refurbished to be reused through ecycleNYC. Medication will be incinerated to prevent accidental poisoning or water contamination. Items that will not be accepted include tires, air conditioners, humidifiers, and other appliances. Residents must provide proof of NYC residency, such as a NYS driver’s license or utility bill. No commercial vehicles are allowed. If you are a community group and are collecting electronic waste and/or harmful household products on behalf of your elderly or disabled community members, please email [email protected] to reserve a drop-off time. Got on line at 10:30. Took about 2 hours. Well organized, but simply too many people. Lines getting in and out were outrageous, but the drop itself was excellent and the staff were great. I also appreciated that they strictly made sure no one cut the line, but they never checked identification. Was that a Jersey car in the line? Yes, there was. The solution is either more of these or limiting access.